This life of the popular saint is illustrated with works of art and features quotes from Pope Francis. It is difficult to pin down the audience for this biography. Kids will need understandings of brothers as monks (as opposed to relatives), lepers, and stigmata. The sometimes-difficult concepts and sophisticated artwork demand an older audience than the picture-book format it is likely to attract. Elschner writes (in an uncredited translation), “Francis sought poverty as his companion in life.” The text refers to Francis’ famous Canticle of the Sun, but it’s just that: a reference, not a description or the text of it. And Elschner describes a Christmas Eve service Francis held: “He sent an ox and a donkey to a cave. He filled the manger with fresh hay. There lay the child.” Wait. What child? 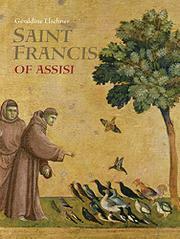 The historical works of art that depict the life of Saint Francis, while beautiful, also may confuse young readers, as Francis’ appearance changes from page to page. In one instance, before the page that talks of his death, he appears in a cloud above a sick child, seemingly dead himself. In another, the chosen illustration depicts not the stigmata that the majority of the text talks about but Francis’ follower Sylvester’s expulsion of evil spirits from a town. Pope Francis’ quotes are mostly relevant to the content on the page and include date and event references.